I wondered if you could confirm if this is a Canthigaster solandri. My friends if more orangish and this one has a darker body without the lines on the top of the body. I wondered if that was because he was a juvenile. One is a flash at night (green dots) and one is him during the day. His eyes appear green. 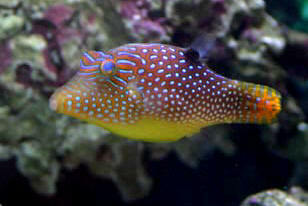 Very cool little fish and I love him! He doesn’t seem to bother the other fish and him and my engineer goby like to play tug-of-war with the scallops I feed them. He also eats to the point of looking like he is going to pop! Crazy little thing! Thanks! Yes, I thought C. ambon as well, however there are no radiating lines from the eye area like C. ambon. Also it seems that mine is more dark brown, similar to the darker version of C. solandri which was confused with C. papua at one time. Can you tell me if this is a male or female? I thought male because of the larger spots. 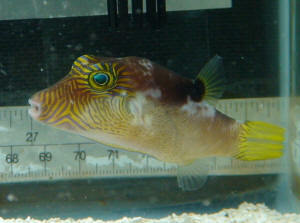 Came across your helpful site and looking through the pictures, my fish seems to be closest to Canthigaster bennetti [Bennett's Sharpnose puffer], but not sure. I have been trying to identify this fish since I first saw it, and this has been the closest I have got to it. I hope you can identify it for me. Thanks. 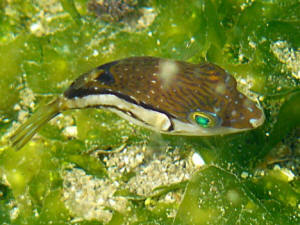 Seen in a rock pool in southern Kyushu Japan on the 11th June 2009. Thanks very much for a prompt reply. Yes, I think you could be right. So I can now file the fish in the appropriate place.